Long lasting colour which conditions and protects. Contains Apricot Kernel Oil and Vitamin E. Fragrance free and hypoallergenic. 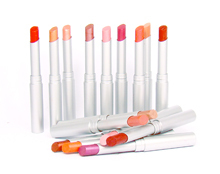 Our popular classic lipstick in slim-stick container. Keeps lips moist and colour lasts and lasts. As with all our products it is designed to be suitable for the most sensitive of skin and is fragrance free.